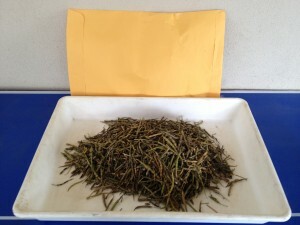 Seed samples can be collected from the paddock prior to harvest. Even after harvest, seed heads can usually be found often between the crop rows. For wild oats, brome, barley grass etc. 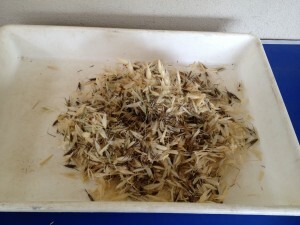 that shed readily, seeds are usually found on the soil surface. Contaminated grain or header screenings can also be sent. We have equipment to separate the weed seeds. Sampling will depend on the resistance situation of each paddock. If resistance is widespread, then collect seeds following a ‘W’ shaped area every 10-20m across the suspected paddock or problem area. Alternatively, you may collect seeds from suspect areas. Do not bias the samples by collecting seeds from a small number of plants but aim to collect a similar number of seeds from each plant. If the seeds are not completely dry they should be sent in paper envelopes to avoid rotting in plastic packaging. During registration you can choose herbicides to test. To finalise the registration at least one herbicide must be chosen. If you are unsure, simply select Group Z-Endothal and leave us a comment in the Comments Box that your final herbicide choices will be made available at a later date. 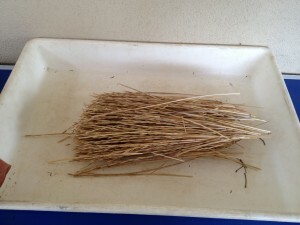 To complete a resistance seed test, about one cup equivalent of clean ryegrass (about 50 seed heads is required. Where there are lots of ryegrass individuals in the paddock don’t collect from only a few, but try to collect 1 seed head per plant. For species with larger seeds such as wild oats, brome, barley grass, wild radish etc. and icecream container full is sufficient which is equivalent to an A4 sized envelope full of seeds. Please ensure you send sufficient seed to represent the area of interest. Sending more seed is better than not enough. Seed tests take about 12 weeks. Pre-emergence herbicide testing of ryegrass begins in February once dormancy has started to break. Every effort will be made to get results back to the sender by the end of March. Receiving seed samples before January will ensure results for pre-season planning.